Each year the World Science Fiction Society holds Worldcon – an annual convention – in different parts of the world. It’s a movable feast, although more often than not, it’ll be held in a US city. In the past, the UK has had a decent crack of the whip, with a couple of outings to Glasgow and Brighton. But the last time it came to London was 1965. It was probably time for a return. And I duly signed up for its return this year. Like most things, I don’t read enough SF (and even less Fantasy), but I enjoy the genre and pay attention to it. And I don’t go to conventions. I once went to a Babylon 5 related gathering years ago in Birmingham but that really is it. And I don’t know anybody who goes to conventions either. It’s not a “thing”. I just haven’t been. LonCon 3 – as this edition of Worldcon is known – was held in the massive aircraft hanger than is ExCel in London’s Docklands. I don’t believe anything has ever filled ExCel. During the Olympics, when several sports were held there, there were additional unused halls. And even something like the Boat Show, which sees gargantuan luxury yachts inside on stands, still has plenty of space over. The last time I went to that show, I was attending a different show altogether than happened to be on at the same time. That’s how much space there is there. But that’s all by the by. What did I take away from LonCon? If you think US presidential races last a long time, you’ve not seen the campaigning that goes on for Worldcon. While this year’s event saw Kansas City win the right to hold the 2016 convention, all the 2017 nominee cities were in attendence, as was Dublin looking ahead to 2019. And seemingly Perth is already looking at 2025. Because lots of people travel a long way to get to a Worldcon, everyone tends to show up at the start of day one. Consequently it took about an hour for me to queue for registration. I was travelling daily to the site, but in future, it’d be worth staying in an on-site hotel, because there’s no getting away from the fact that ExCel is horrible to get to. People are very polite and friendly. Really polite, and very friendly. There’s this thing with badges and ribbons I didn’t really understand. Like many conferences, everyone gets a badge on a lanyard to wear while attending. Given that ExCel is open to the public (not that anyone not attending something there would ever “pop by”), security needs to know who to let in, and who not to. So far, so normal. But then people start to attach things to their badges – ribbons supporting different future cities (sometimes competing cities on the same badge); ribbons saying that this is their first event (if I’d seen these I suppose I should have had one); ribbons saying that they voted in the Hugo Awards (ditto); ribbons saying no photos (a polite way of dealing with an issue that fandom has sometimes struggled with); and so on. Then you might put stickers with your country’s flag on it, perhaps indicating the language(s) you speak, or where you come from. By the end of the convention, some people’s badges took on the look of Tom Baker’s scarf in Doctor Who. It’s very international in flavour. Although obviously dealing with English language genre material, attendees come from all over the world. Especially America. Did I mention that ExCel is big? I made the mistake of getting off the DLR at Custom House rather than Prince Regent on my first day. That’s half a mile of additional walking right there, because while both directly serve ExCel, one serves the west end, and the other the east. Lesson learned. If you’ve not been to a convention before, and think it must be a lot like those ComicCon pictures you’ve seen in the press, then think again. The “only” stars in attendance were writers. While people do wear costumes, it’s notable that the big Masquerade cosplay event is mostly about self-created apparel. Most people wear T-shirts. Nearly everything was about books and literature, not forthcoming Marvel or DC universe films. I should have read the copious literature in a bit more detail ahead of time to better meet people and learn about how things worked. But I didn’t. And therefore I failed to go to the “So: This Is Your First Convention” session. Fail. The company who put together the convention’s T-shirt order probably did too few. They’d sold out of most sizes smaller than XXL in many designs by Friday. Nobody pays for autographs. There are just polite queues at signings, and occasionally people asking for autographs at the end of panels. I genuinely don’t understand why anyone would buy an autograph. I see those adverts for events in the back of magazines like SFX where dozens of people seemingly supplement their TV show residuals with cash in hand for autographs. It sounds like a horribly grubby and grasping business. I’ll never forget seeing Dave “Darth Vader (not the voice)” Prouse sitting forlornly behind a desk at the aforementioned Babylon 5 gathering (nope – he wasn’t in it) with a pile of 10x8s awaiting cash for signatures. There are panels. Lots of panels. Panels can be good, and they can be bad. For conferences, I think the fewer panels the better in most circumstances. All too often they can be unstructured and nobody is really sure why they’re there. Fortunately I saw more good panels than bad ones at LonCon. And the variety is immense. Did I mention that there were a lot of Americans in attendance? This isn’t surprising given the importance of Americans to the state of English language SF, and the prevalence of conventions there. While I know that the UK isn’t short of a convention or two, you only had to look at a massive display of advertising literature – split by coast – to see how big an “industry” it is there. This was easily the most access-aware event I’ve ever been to anywhere. Every room had specific places laid out for those with access needs. Lifts were in place for those who needed them, and the convention even had a company supplying those who needed them, mobility scooters and wheelchairs. And it was also the most friendly place I’ve ever been to in terms of LGBT awareness. Entire streams of the conference addressed some of those areas. In general, anyone who wanted to, could be themselves in comfort and without fear of what others might think or say. I mentioned that there was a lot of literature provided to attendees. A large magazine/book as well as a pocket spiral-bound book to help you navigate the venue. But I really liked their app from a company called Grenadine. With a couple of tweaks, this would be nigh-on perfect. The convention wasn’t nearly as commercial as I thought it might be. Aside from some book publishers, clothing manufacturers and a few others, the Dealers Hall wasn’t as outright commercial as I thought it might be. But did I come away with a Micro Drone? Of course I did! I also came away with quite a few books. Something else I learnt about was filk – an SF fandom take on music. I’m not sure what that really means, and it seems odd to me that fans of a particular genre would need their own music. But each to their own. In any case, there was also a Worldcon orchestra made up of musicians of many major UK orchestras. You can never beat hearing the Star Wars theme played by a live orchestra – even in an aircraft hanger. ExCel doesn’t have the greatest range of food available. But it could be worse. It could certainly be cheaper too. Think – captive audience, miles from anywhere. A first for me was a contactless Coke vending machine. Kaffeeklatsches and literary beers were something new to me. You had to sign up early to see who you wanted, but the idea is that about 9 people and a writer sit around either drinking a coffee, beer or other beverage in a rather more intimate setting. As I’d enjoyed Wolves, I sat down with the very friendly Simon Ings. He’s also a fan of Ed Reardon’s Week it turns out! I really must right the wrong that is never having read any Iain M Banks. He was a Guest of Honour in absentia at LonCon, and part of the reason I went. There were some great talks about him and his work. 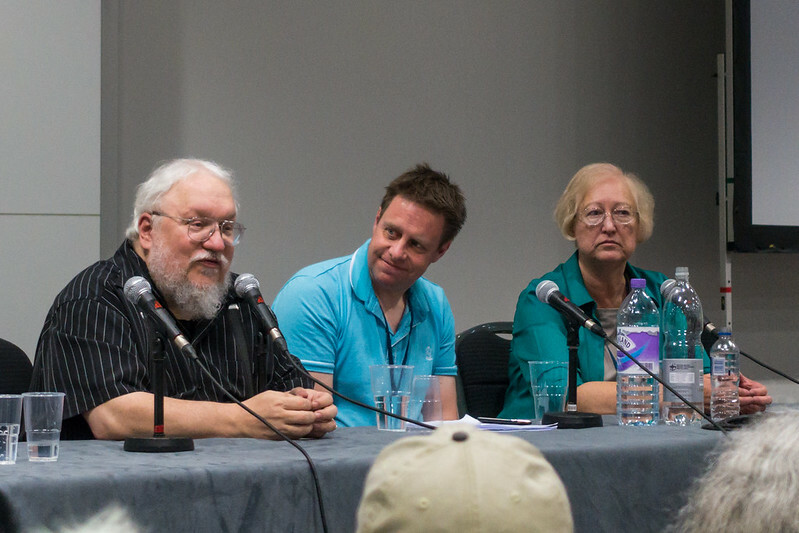 If I hadn’t been in a session about Iain Banks, I wouldn’t have been able to get into the rammed George RR Martin and Connie Willis session either (photo above). Despite loving Game of Thrones on TV, the first volume of is Song of Ice and Fire saga is still unread at home, despite me saying that I was, “going to read it before the TV series starts.” And I’ve not read any Connie Willis either. I picked up To Say Nothing of the Dog while I was there. Sound was mostly pretty good. Despite having more than a dozen simultaneous sessions taking place in different suites in Excel, they all had proper PA systems in place. The bigger problem tended to be speakers not knowing how to use microphones or speaking clearly. Lots of people in a room – even a small room – swallow up sound. As a rule, I’d suggest that Americans are more confident in Brits at projecting their voices. The range of panels and sessions was truly astonishing. Everything was covered. So congratulations on whoever put the programme together. I still find it incredible that I can get to vote in awards as prestigious as the Hugo Awards. It really is akin to me having some say in the outcome of the Man Booker prize. It’s a really nice position sitting between jury-run prizes (i.e. most of them), and an open public vote. The former, by its very nature is limited in scope and can be heavily dependent on the jury. While the latter tend towards the populist, as opposed to the good, and can be subject to groups trying to fix the vote. Everyone who pays to be a member or supporting member of a Worldcon, gets to vote in the Hugos categories. And in recent years, a “voter packet” of ebooks of many nominated titles has been distributed to let you read any of those that you’d missed. Obviously, this still means that you don’t actually have to have read (or watch) all the titles, but you at least have the opportunity. In one instance this year, the entire Wheel of Time sequence of 14 novels was nominated. And yes, they sent us all of them. Let me tell you that I really had to work to get a file that big into my Kindle app. And no, I’ve not read them yet. (There was also a clumsy attempt to get some more right-wing stuff onto the ballot this year, but in the end, the voters ended up choosing the best material). And it’s really rather wonderful to be able to attend the awards ceremony. Has anyone ever let a mere reader into a Man Booker Prize ceremony? That particular award managed to just publish a long list that included books that members of the public can’t yet buy because they’ve not actually been published. So it was delightful hearing from John Chu and Ann Leckie as they picked up their awards. So there we have it. A very worthwhile event, and actually pretty reasonably priced for an event that lasts five days, even though I was back at work for day five. Will I be going to Sasquan next summer in Spokane? Probably not – unless I decide a Twin Peaks tour is in order. But other conventions, even if they’re at awkward places like Heathrow or awkward times like Easter, are definitely on the cards. I quite fancy going to a crime one too. I enjoyed your conrep a lot – well done! Clearly expressed and I like the bullet point layout. Keep coming to cons and enjoy yourself!